★ Rise of the Superstar Vloggers (BBC3, 9pm) Documentary about the modern success of video bloggers, who have become incredibly famous in the eyes of their young audience. ★ The Supergamers (BBC3, 9pm) Documentary profiling three British video gamers. Obsessed with my Body (Channel 4, 10pm) Documentary about people determined to improve their bodies, in light of a statistic that shows British men now spend 30% more time in the bathroom grooming. The Virtual Reality Virgin (BBC3, 10.30pm) Documentary where Tyger Drew-Honey experiences virtual reality, tipped to become the next big thing in technology and leisure time. 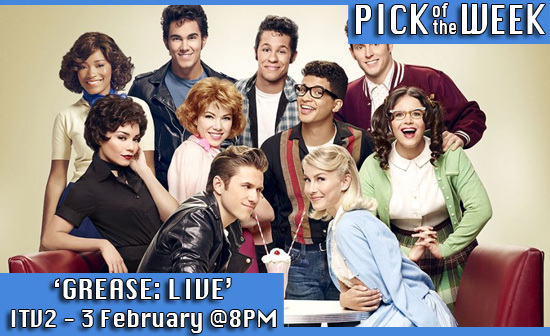 ★ Grease: Live (ITV2, 8pm) UK showing of the recent musical special from NBC. Starring Julianne Hough, Vanessa Hudgens & Aaron Tveit. Camila's Kids Company: The Inside Story (BBC1, 9pm) Documentary about the rise and fall of the children's charity run by Camila Batmanghelidjh. World War Three: Inside the War Room (BBC2, 9pm) Documentary speculating on a 'hot war' in Europe, involving nuclear weapons. Webcam Boys (BBC3, 10pm) Documentary following men who show their naked bodies over the internet for money. The Keith Lemon Sketch Show (ITV2, 10pm) Series 2 of the comedy sketch show. The Most Dangerous Band in the World: The Story of Guns N' Roses (BBC4, 10pm) Profile of the successful rock n' roll band. Nothing. Let's go fly a kite! ★ Patrick Kielty's Mulholland Drive (BBC2, 10pm) Documentary about William Muholland, who built L.A's water infrastructure which ultimately led to the city's prosperity. Presented by Patrick Kielty.